Sometimes a little mention, a tidbit, can open the way into finding a lot of new information. When Donna played in Grand Rapids there was a mention in the paper about the company having played in Calgary, Canada. So, I thought I’d see if I could find any Canadian newspapers that might help in the quest. One of my favorite sources for newspaper information is The Ancestor Hunt (http://theancestorhunt.com). I checked there and sure enough, Kenneth Marks had an entry for Alberta Canada and lots of papers listed. I checked the links he had there that mentioned Calgary and didn’t find anything for the month and year I was looking for — Bummer. Although his links didn’t help this time, they usually do. When I poked around I found a site, “Our Future, Our Past” that had early Alberta Newspapers. Following the Early Alberta Newspapers link brought me to a couple searches, one papers by year, another by place. I figured that 1920 is the year I’m looking for so away I went. Wow. Over thirty newspapers listed. The dates threw me off for a second as they are listed dd/mm/yyyy but I got past that and jumped into “The Calgary Daily Herald. Hummm… It was the Daily Herald, however only 10 papers were there for January, 1920. I later learned that those were the pointers and the other papers were also there. I clicked on the Friday, January 9th newspaper and began to peruse. Wa-La! there on page 14 was the now familiar Tom Brown Saxophone Clown photo and an article, “ACTOR HAS GOOD WORD TO SAY FOR RAILWAY SERVICE – Roy Binder, of “Chin Chin” Company, Strong for Canadians.” The article talks mostly about Roy’s thinking that the Canadian Railroad is better than the US railroads. 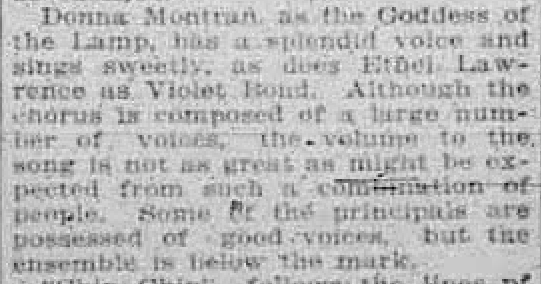 The article also mentions that they (the “Chin-Chin” company) played in Lethbridge for two nights preceding. (Apparently the 6th & 7th) and in Medicine Hat. Page 16 had a fairly standard Chin Chin ad and that the show was playing at The GRAND. Then Page 26 had an article where Donna is called out. The article also mentions an “almost at capacity house.” Which got me to wonder what the capacity is. Looking at the January 5th newspaper there was an ad that showed the show’s run for three days. A Google search brought up the theater’s website and a Wikipedia entry. According to Wikipedia, The theater was built in 1912 with a capacity of 1300 seats and was the largest stage in Canada when it opened. It was very modern for its time, boasting 15 changing rooms below the stage with hot and cold running water and electric lights. In 1957 the Grand converted to a movie house. In 2005, the Grand was purchased and turned into a “culturehouse” for contemporary live arts. The Julius Cahn-Gus Hill Theatrical Guide and Moving Picture Directory for 1913-1914 indicates that the theater was much larger than the Wikipedia entry says, hosting 1590 seats — 913 on the lower floor, 280 balcony, 263 gallery, 68 loges, and 66 in boxes. The stage was large, 36×36; the distance from the footlights to the back wall was 40 feet. The rigging loft was 75 feet up. This was a very large theatre for a city with a population of only 30,000 (Drawing population of 60,000). By comparison, the Lyric theatre only seated 980 and the Empire theatre only 700 people. Today, Theatre Junction GRAND | Multidisciplinary Live Art is Western Canada’s oldest theatre and home to theatre, dance, music and film. 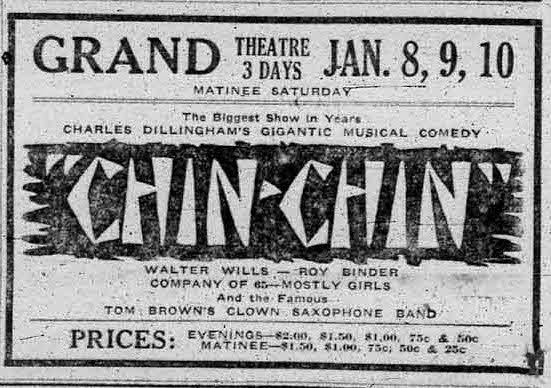 Chin Chin played the Grand Theater, Calgary, Alberta, Canada, on January 8th, 9th, & 10th, 1920. Sadly, the “Our Future, Our Past” newspapers haven’t been OCRed, so the collection is not word searchable. However, it is an amazing collection and well worth looking at. Many thanks to the many folks at the Alberta Heritage Digitization Project for making the collection available.